Development of the personality and changing behavior is possible but it’s not as easy as swallowing a pill or having an “A-ha” moment. Your brain is capable of changing from emotionally-driven automatic behaviors, to creating new patterns of behavior and new pathways in the brain. Rather than just a list of tips and things to do, the SSPS Developmental Framework focuses on brain development and emotional maturation. Building on the work of pioneers in emotional and social intelligence such as Daniel Goleman and Daniel Siegel, the Developmental Framework teaches you how we grow and mature emotionally. It provides you with all of the tools you need for emotional and relationship development. Build Self-Awareness: Learn to identify, acknowledge and accept your feelings, especially those that are difficult. Master Self-Care: Learn to be aware of your physical, mental and emotional needs and to attend to yourself in a consistent fashion. Harness Your Emotions: Learn to direct your emotional energy so that your feelings are expressed constructively, rather than as judgment of yourself or others. Build Relationship Awareness: Learn to observe others and to recognize how you are feeling and how their feelings are affecting you. Master Relationship Care: Learn to identify how your emotions affect others and how to manage your emotions in relationship to other Styles. 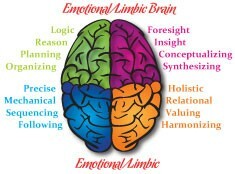 Learn how to use your "whole brain" and harness the power of your emotions by using the Developmental Framework. Increase your Self-Awareness by taking the SSPS Assessment now!